Color(s): Fawn and black, golden, black, white; may be tri-colored. The Puggle is a cross of two breeds: Pug and Beagle. They are often referred to as a "designer dog" and have become popular companions. The appearance of the Puggle varies widely. An ideal Puggle possesses an athletic, slightly longer body like that of a Beagle. They also have a leaner and longer muzzle. Puggle's retain the large, round eyes, curled tail, and wrinkles of the Pug. The Puggle is affectionate, active, fun-loving, and even-tempered. They thrive on attention and human interaction. They do not do well if left alone for extended periods of time. If bored or lonely they will become destructive and bark or bay incessantly. They do well with children, dogs, and other household pets and make suitable playmates. Puggle's are friendly toward strangers, but will bark to announce visitors or out of the ordinary sounds. Occasional brushing with a firm bristle brush is required for the Puggle. The wrinkles and ears must be cleansed daily and bathing should be done when necessary. They are prone to such health issues as heat intolerance, skin infections, eye infections, and respiratory problems. The coat of the Puggle is dense, short, and coarse in texture. The Puggle has a tendency to be stubborn and may be very difficult to housebreak. The crate training method works best. Early socialization and obedience is recommended. They will not respond to harsh or heavy-handed methods. Training must be done with reward, firmness, fairness, patience, and consistency. The Puggle requires a high degree of physical exercise and mental stimulation. They will do okay in an apartment provided they are sufficiently exercised and have a wide variety of safe toys to play with. 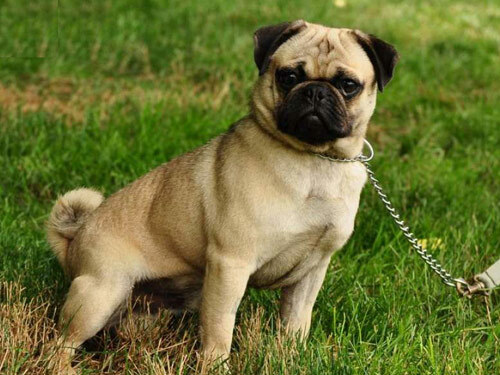 Puggle's must be taken on several securely leashed walks daily and enjoy off-lead play in a dog park. They do best with a securely fenced yard with ample room to romp and run.